I feel like I'm slowly getting the hang of using a pressure cooker when it comes to making sides and I have another amazing recipe for you today. 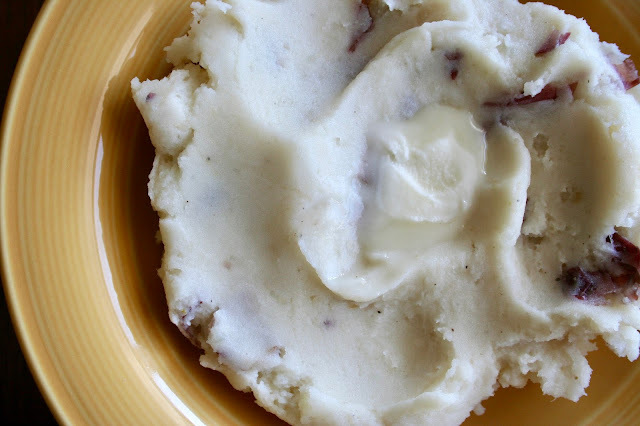 I'm so excited about this mashed potato recipe because it worked PERFECTLY. I swear my mashed potatoes are always lumpy, but these weren't and they tasted so good. I also loved using red potatoes with the skins still on. They had such a better texture than russet potatoes. So if you want to impress your family or friends, you need to make these ASAP. So easy and they're pure comfort food. 1. Place the rack in the bottom of the pressure cooker. Add the potatoes to the pot and pour the chicken broth over the top. 2. Place the lid on the pressure cooker and set to high pressure for 8 minutes. Quick release the pressure and drain the potatoes, preserving the liquid. 3. Place the potatoes in a large bowl and mash with a potato masher or hand-mixer. Add the butter, half and half, salt and pepper. Mix until combined. Add cooking liquid as needed to reach the desired consistency of potatoes. (I've had the most luck getting creamy potatoes by using all of the leftover liquid.) Serve warm.